First Review Gives TAINTED SOULS Five Stars! Wow, that's nice. Thank you B. Price of "Central California" for your very nice review, headlined, "Loved this book from beginning to end." And for the five stars! Here's just a snippet of what s/he had to say: "I thoroughly enjoyed this book from beginning to end. . . . It's one of those books that you don't want to put down until you get to the end to find out what happened." You can read the rest of the review at Amazon. 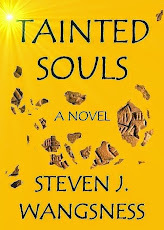 Now looking forward to the debut of TAINTED SOULS in less than a month, I've launched this new website/blog. I look forward to hearing from readers and fellow writers alike.